He let me be his surrogate sister when all the available adoptive daughter positions in his life had been filled. Kathy was protective and kind. Nurturing and guiding. The big brother I had been missing for most of my life. He liked to hang out just to ‘gossip’ as he put it and sometimes shared secrets from his wild youth under the banner of ‘confession time’. But there were certain secrets he vowed to hang onto forever. Believe me, no amount of trying on my part ever succeeded in getting him to part with them. Kathy loved to go visiting and to go out for a meal during the day. Indian food usually, or fish & chips and as often as possible — ice cream. On those occasions I would double or triple up as his driver, bodyguard and companion. But Kathy was much more than a brother who would point out where you went wrong and protect you from harm. He would encourage you and compliment you; not directly though. It would be in the way in which he introduced you to other people. I once flew back to Joburg on the same flight as him. I will never forget two things about that trip. He made me check in with him at the Business Class desk and then persuaded the airline employee to put me in Business Class with him. Then in the lounge some very fancy looking business people came up to him to greet, as everyone did everywhere — and Kathy greeted them all from the so-called lowest to the so-called highest. As these men were about to turn away back to their newspapers Kathy introduced me to them as his sister. We both loved the quizzical looks on their faces. Kathy was the big brother I had missed. But now he has gone. I keep thinking of phoning him and asking his advice or to just say hello or to tell him about something that has happened. When I travel I have to stop myself from dialing him to say goodbye. I know he would make a joke about the fact that I was off again and just like Barbara, didn’t need any excuse to pack my bags and go. I miss having to write to him during his travels to tell him what happened in Isidingo that day. Sometimes I would watch a bit, pause it, type a bit on my phone and continue like that. So by the time the credits were rolling on the screen the complete summary of what had happened was already in his email. Every year around this time I would think very hard about what kind of a gift to give him for his birthday knowing that he wasn’t expecting anything grand or anything really at all. He loved all the birthday attention. 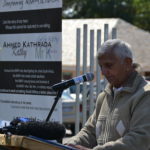 Kathy has a whole army of people who guard his legacy and live as he would have wanted them to live — from his beloved youth wing of the Kathrada Foundation and a host of children, to his family, friends and comrades. The perfect birthday gift I can think of for Kathy this year and for every 21 August going forward is for all of us to continue living his values of freedom, democracy, non-racialism and non-sexism. And of course to always remember that very good Indian word, ‘Shanti’.